Summer has officially kicked off. Traditionally, summer days are destined to tantalise us. We mere mortals with blue skies, blooming flowers, and warm winds and for our liking of food and being aficionados, opens the doors of all things al fresco. Something to enjoy under the open sky. For me, however, happiness is fueled by coffee. Sunny days are all dandy providing that I can enjoy them with a good cup of joe. And there is no better place than in a café with a garden or terrace to satisfy my caffeinated cravings. I embarked on a mini quest to find some cool green spots in Dublin where coffee lovers can soak up the sun with their favourite brew. Fumbally Café is a gem. The vast space boasts lip-smacking food, prepared from local ingredients on the spot. Cosy, spacious, full of books, and happy chatter. 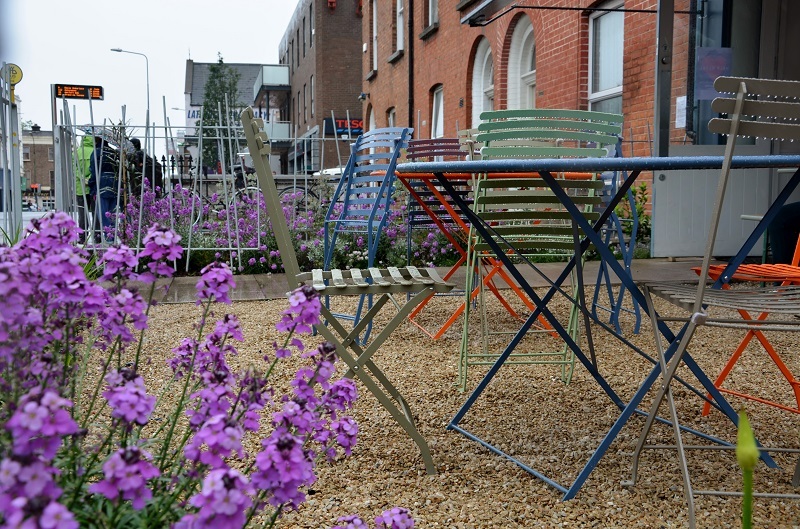 And, the café has got a slick garden. Although petite in size, the plot is lush and cosy, literarily oozing with greenness. Just grab a bench and put your feet up. You can easily tune out, resting and assure you won’t be spotted by that snooping neighbour living next door. Coffee is definitely close to their hearts. With 3FE and the Barn on the menu, you know you are in good hands. First Draft Coffee has even teamed up with The Fumbally Stables to provide cool coffee training and classes for pros and noobs like me. 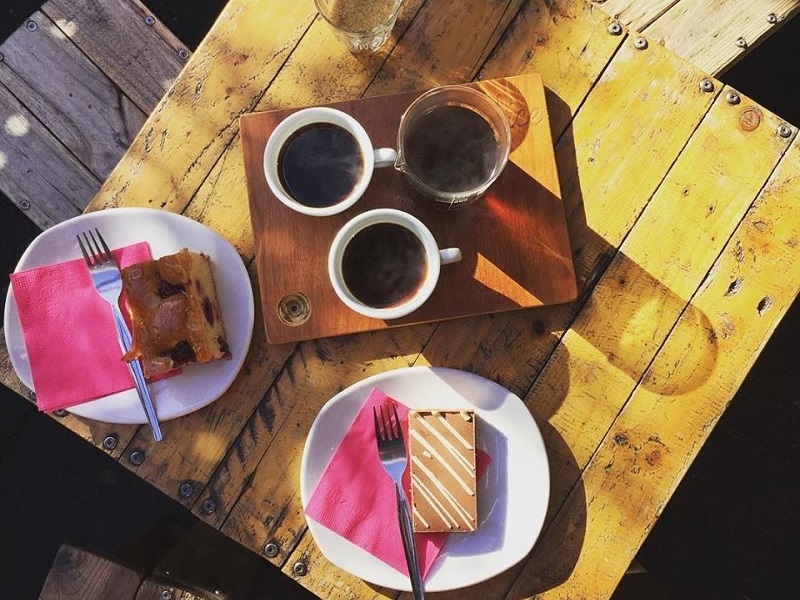 So to pamper your stomach or treat your taste buds to a nicely made flat white, this foodie haven of Dublin 8 should be on your list. 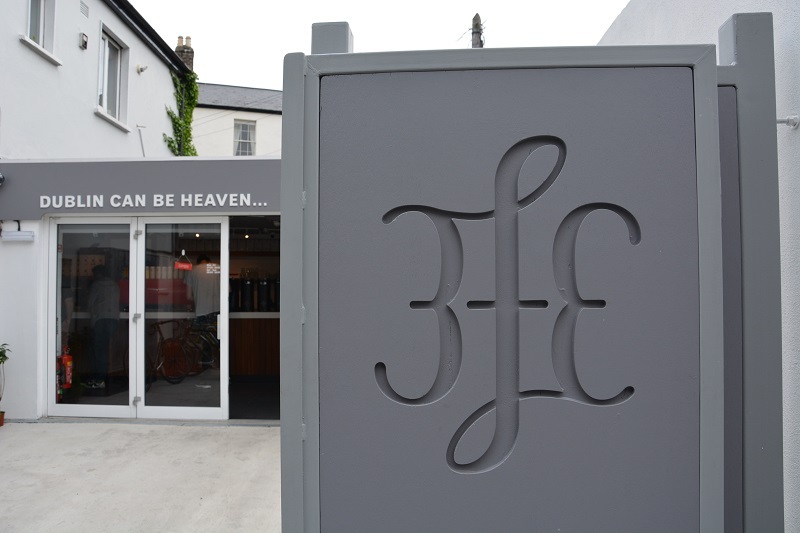 A sister café to the now iconic 3FE in Grand Canal Street Lower, 3FE’s Sussex Terrace certainly helps keep Dublin buzzing. And the café boasts a terrace that any sun-loving Dubs should visit. With the minimalist design, it is all about enjoying the sunshine and coffee. No surprise, the place lives and breaths coffee. With the selection of cool gadgets, utensils and even T-Shirts, it is a treasure trove of all things coffee addicts dream of. So that’s your next Christmas/birthday/ anniversary gift ideas sorted for a year. Located in the heart of Portobello, Wall and Keogh does it all “for the love of the brew.” The crew, led by the owner Oliver Cunningham, definitely loves a good cup of tea. With over 150 teas to choose from, even coffee sippers will find something for themselves. Plus, the gang can whip you up some epic Chai Lattes based on their own formula. And what a better place to enjoy that goodness than in their back garden. 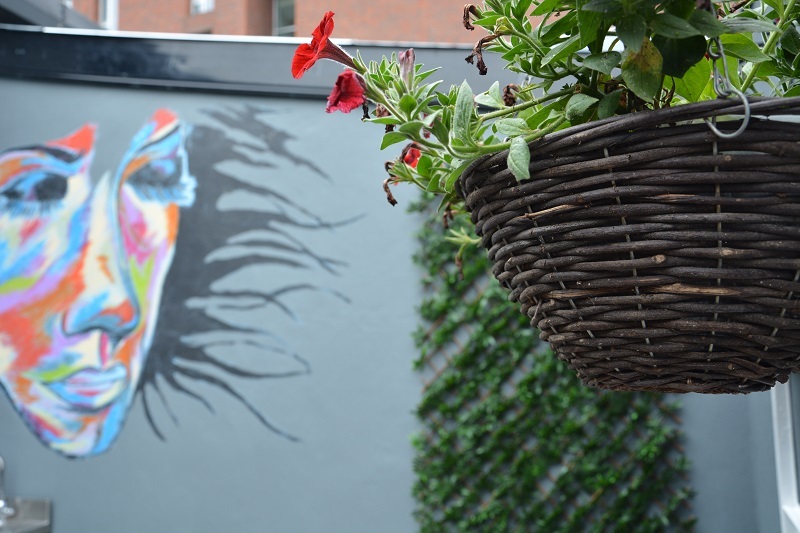 Neatly tucked away from the bustling streets of Dublin, the space is big enough to host a group of tea or coffee enthusiast on the lookout for some tasty nosh and sugar bites. Guarded by a mini skylight roof, you can definitely sip away regardless of whatever the Irish summer brings to the table. Bubbling with energy, the perky Two Fifty Square allows us to enjoy a good coffee in the sunlit and open space. It is always bright inside, regardless of the weather. Behold the mystical power of the roastery. 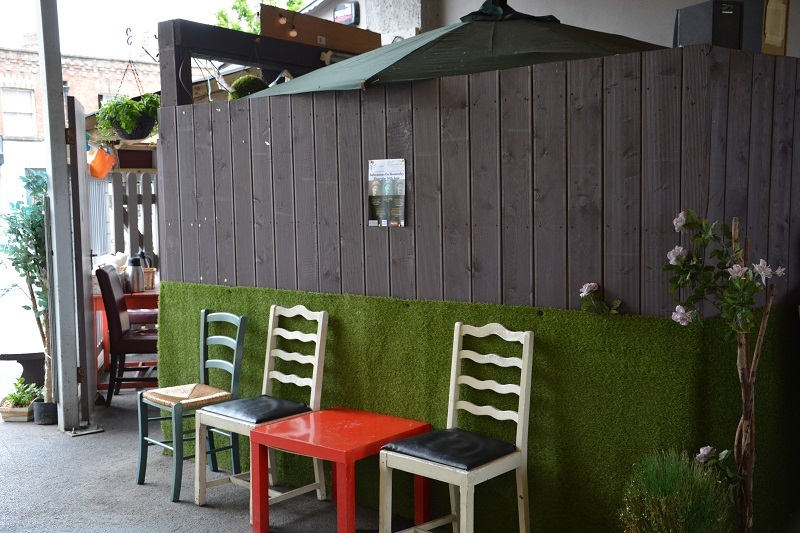 The cool thing about this Rathmines-based place is that it offers two mini gardens: at the entrance and at the back. I like the backyard one as it is more intimate, slightly more secluded and I feel more relaxed there, ready to catch up on my reading. The café is slightly aside, which clearly makes it even more enjoyable as you can really leave all the noise behind the door. Cooking up some of the best coffees in town, Vice Coffee nicely combines the elements of a speciality coffee house with the perks of a bar. As the café lives at Wigwam, visitors are welcome to grab more than coffee. Tasty menu and a hefty selection of beers, rums and cocktails do come handy, but my real winner is the rooftop terrace. Why? Because it is gorgeously casual and roomy. On a beautiful day you can easily sneak out there to take a breather and to enjoy that smooth flat white you’ve just ordered. I stopped by there on Sunday’s afternoon and it was pleasantly quiet and intimate. 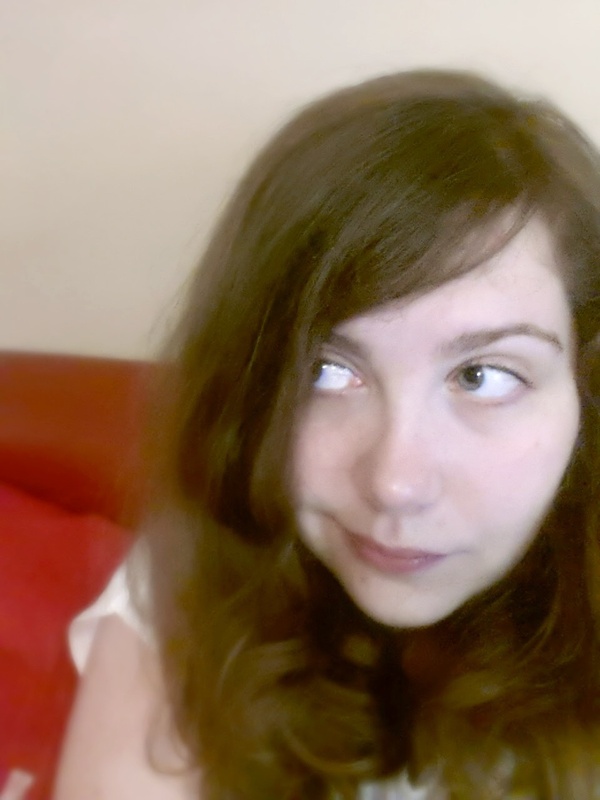 As a person sunbathing in the shade, I simply adore this place – I swear I must have been a penguin in my previous life as the sun simply doesn’t agree with me. 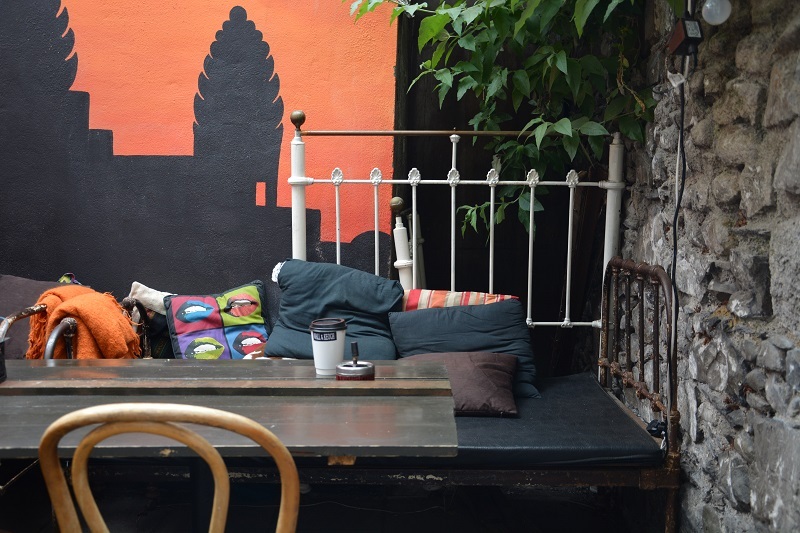 And with Vietnamese Iced Coffee or more traditional ‘hot’ caffeine fix, all you have to do is to immerse yourself in the summerly vibes. Last weekend brought me to Little Bird, another sweet spot of Portobello. The café merges a yoga studio with a foodie hub offering delish, freshly made food. The coffee station is powered by the good Badger and Dodo beans so you can expect deliciously vibrant flavours. What hit the spot for me was the garden. Although located near the street, the space remains intimate and peaceful. Surrounded by the ribbon of flowers, you can bask in the sun with your cuppa or hide under the awning gracing the café’s front window. If you are a yoga fan or not, it’s a great place to stretch your legs and unwind. One of the most beloved places in Ranelagh, Nick’s Coffee is always packed with people. The guys are the walking rays of sunshine, which is a great remedy for any rainy day. 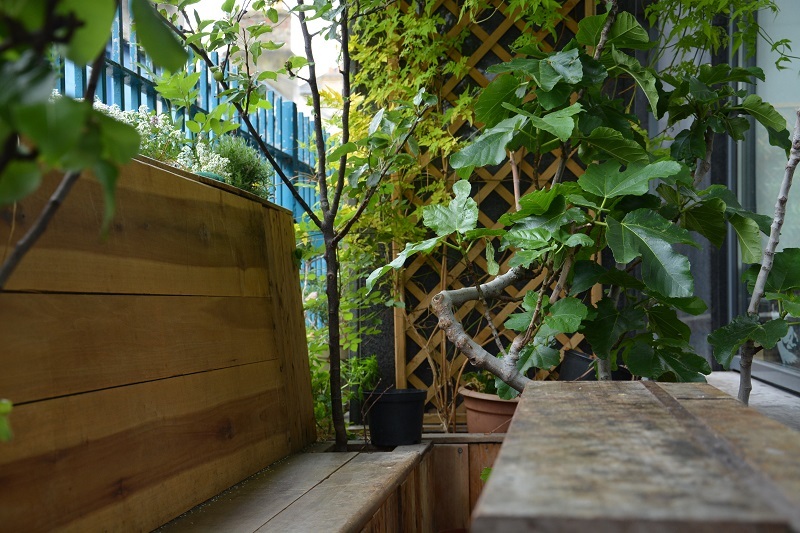 Though very small, the café has got a rather big outdoors area. Colourful and positively hyped, it is definitely as cheerful and the crew running that place. Kept under the canopy, and with some extra seating scattered around, the café offers city dwellers a nice spot to chill out. Unexpectedly spacious, it allows chatterboxes like me to catch up with friends without a fear of butting into someone else’s conversation. Plus, if your granny or grandpa needs a morning fix, the guys will satisfy their cravings on the house as they serve free coffee to all the silver surfers aged 65+. Previous story Quiz: Which Gin Cocktail Suits your Personality?